It’s been a while since we convened our Boy’s Brunch Club (a.k.a the cunningly abbreviated ‘BBC’). This time, rather than stick to already tried and road-tested brunch venues like Hawksmoor or The Modern Pantry, we decided it was about time we found some new places to add to the circuit. Cue in the rather quirkily named Giant Robot in Clerkenwell which D and myself first came across at Jamie Oliver’s Feastival @ Clapham common last weekend. 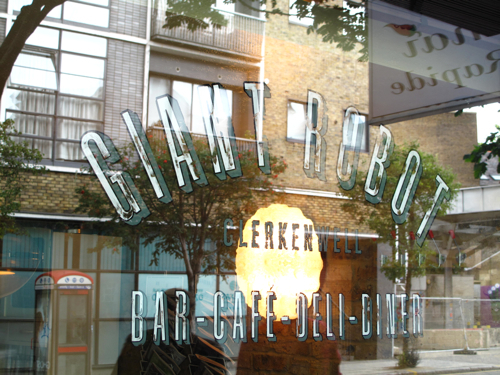 The brainchild of Jonathan Downey, the man behind the Match Bar Group, Giant Robot has the feel of a NY style brunch-cafe-bar… its airy, industrial warehouse interior of brick walls, aluminium ceilings and wooden panelling are reminiscent of NYCs meatpacking district. It’s a little dark inside, but the old school leather sofas and toggle-style light switches give the place an eclectic yet vintage look of somewhere worthy to kick off a lazy weekend. Foodwise, the weekend brunch menu is a shortlist of your all-American diner classics and you can either choose from the house combinations or DIY your own. You can find the usual fry-up suspects (streaky bacon, hash, sausages, eggs), pancakes (plain or blubbery with maple syrup) and a selection of juices, smoothies and coffees to wash the food down. 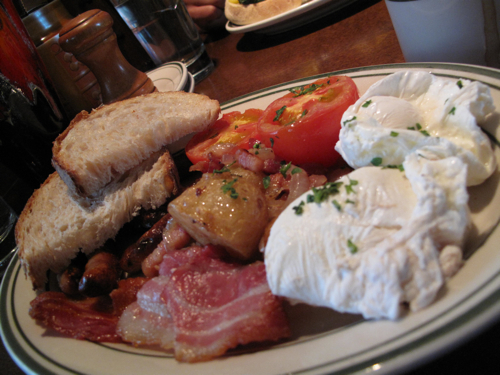 Most of our group being boys went for the Brooklyn Breakfast, a house combo of sausages, bacon, hash, roast tomatoes, sour dough and eggs how you like ’em. Despite the concise menu, the kitchen struggled at times to cope with our table of 6. We must have debated the recent ruckus and social unrest in Malaysia for more than 40 minutes before our food showed up. And when it did, a couple of our orders lagged behind the rest… in fact, J’s side order of streaky bacon quite simply just didn’t show up until we had finished our meal. 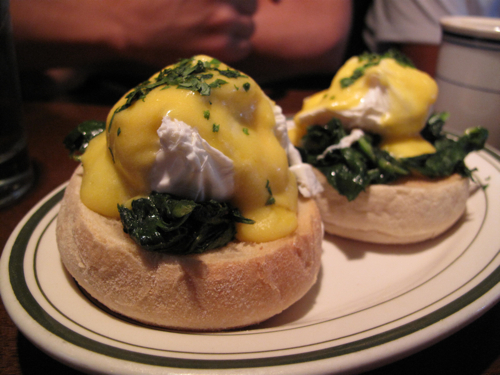 Although most of the food was okay, those of us who ordered poached eggs however were not happy bunnies at all… the yolks were so overcooked it may as well have been a hard-boiled egg. 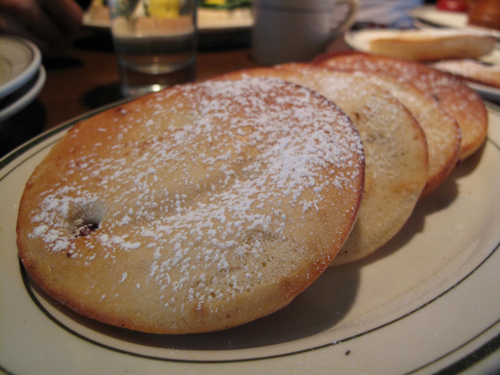 If there was one saving grace, it came in the form of their blueberry pancakes of which we shared a stack of 6. Large, moist, fluffy and served still warm with the blueberries just about bursting through their skins, it’s some of the best pancakes I’ve had this side of the pond. Perfect when doused generously with maple syrup. Service for our corner table, though warm and friendly on the whole was a little absent at times. We found ourselves pining to get the waiters’ attention to remind them about our missing orders and to get our hands on simple. no-brainers like ketchup and sugar cubes for our coffee. For what it’s worth, the staff did try to make up for the missing bacon mishap by taking it off the bill and bringing us some additional pancakes on the house which was a nice gesture. The verdict? 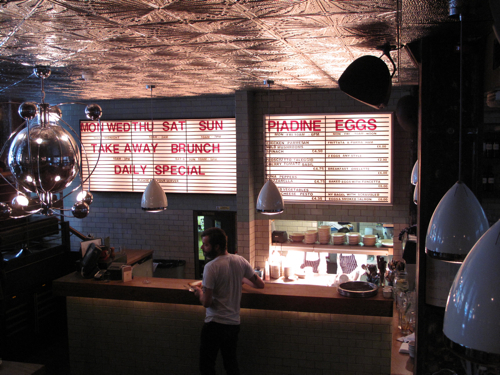 – a quirky, comfy place for a long, lazy, linger of a Weekend brunch. The pancakes are great… the coffee decent… and if you need a some amusement, just head to their gents’ and where you will find a picture of Silvio Berlusconi smirking at you on the entrance to the male toilets. You will need to have a little patience with everything else though. If they make you wait too long (or forget your bacon), the much more dependable Modern Pantry is just directly opposite on the other side of the road.